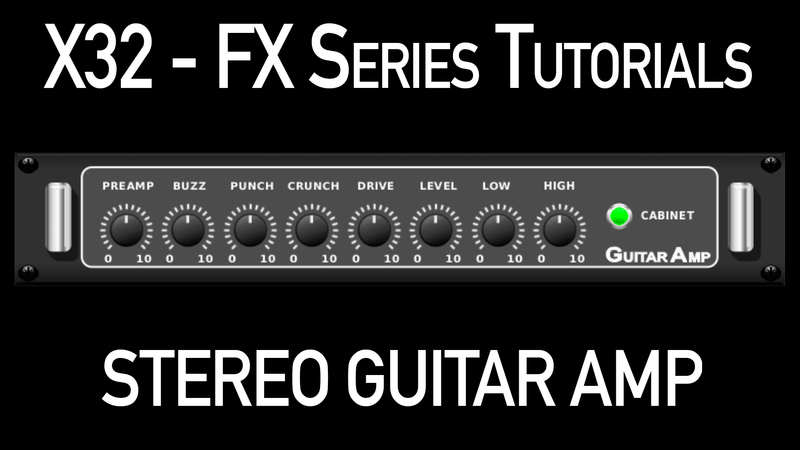 Welcome to my Behringer X32 FX Series tutorials. Today we are going to be looking at the Stereo Guitar Amp and Dual Guitar Amp. The Behringer Stereo Guitar Amp is an emulation of the Tech21 SansAmp PSA-1 and can emulate the sounds of a range of different types of guitar amplifiers. While this is not an effect you would use all of the time, I can see some specific uses in smaller bands or even youth rooms in churches that don’t have space or budget for an on-stage guitar amplifier. This effect would allow the direct connection of an electric guitar to the X32. I would recommend using a direct box to interface your guitar with the XLR connections rather than trying to go through an aux input. The Aux inputs of the X32 are going to have less gain adjustment than using one of the XLR inputs. Plus, the impedance of a direct box is going to balance the high impedance load of the guitar in a better way than the console. Pre Amp – The Pre Amp parameter controls the sensitivity of the input section of the effect. This can also be thought as the gain before the band specific distortion (Buzz, Punch, Crunch, and Drive). Control allows for adjustment from 0.0 to 10.0. Buzz – The Buzz parameter controls the low-end breakup and gain. Control allows for adjustment from 0.0 to 10.0. To get more a more buzzy distortion, increase the level of the buzz control. Punch – The punch parameter controls the mid-range breakup and gain. Control allows for adjustment from 0.0 to 10.0. To get a more clean Fender-esk sound, decrease this parameter from the center point. To get a more Marshall-esk sound, increase this parameter. Crunch – The Crunch parameter controls the high-end harmonic content and pick attack. Control allows for adjustment from 0.0 to 10.0. Drive – On a lot of tube amplifiers, there is not a master volume on the amplifier. The last volume control is the gain on the power output section of the amplifier. The Drive parameter controls the distortion from the power amplifier section. Level – The level parameter controls the overall level of the effect. Control allows for adjustment from 0.0 to 10.0. Cabinet – The Cabinet button allows a modeling of a ‘mic’ed guitar cabinet’ if your musician is using a mic’ed cabinet but is using this effect as an insert and then routing sound to the cabinet, I would suggest disabling the Cabinet parameter. Otherwise, I would leave this on. 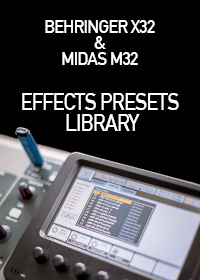 Low – This is an EQ control of the effect to fine tune the output sound from the effect. Control allows for adjustment from 0.0 to 10.0 with a default setting of 5.0. High – This is an EQ control of the effect to fine tune the output sound from the effect. Control allows for adjustment from 0.0 to 10.0 with a default setting of 5.0. Again, I am sure some of you are thinking WHY?! WHY Drew, WHY did you spend time on this one?! I remember when I was in youth group at my small church in Oregon, an amp simulator like this would have been perfect for our really small completely untreated cement brick room with metal support beams in the middle. With some small rooms (well, really any small room) a live amplifier will NOT be a good idea. Having the ability for someone to plug their Squire Strat into a DI box and then have the board do some amp modeling will be a perfect solution for some people. Granted this is not for everyone, but this may help some of you! There is another use for this gem of an effect… I use it in a ‘fake bi-amp’ setup for my bass. Using the tube preamp model I can get a fat, warm sound in the low end. For the high end I parallel process it through one of the ‘virtual channels’ on my XR12 and the guitar amp sim inserted. I can crank up or turn down the grind as desired, and the low end stays solid and clear. Hi. I guess this goes in the insert rack and not in the side-chain rack, am I right? I’m using it for my bluesharp, great sound. AWESOME idea. I can’t hardly wait to try it.